It’s Saturday morning, I’m on Instagram and find this meme of Amy Jackson, reviving the rage I first felt when I saw her acting in a Tamil film. Amy Jackson is a 25-year-old white British actress who appears in a variety of Indian films. Her appearances result in feelings of neglect and, in turn, can lead to identity confusion. How can we, as dark-skinned South Asian women, embark on this “woke” boat, practice self-love and empower ourselves, when the media in both the West and East is insinuating that we’ll never be good enough to make it on the big screens? In most Bollywood films, it seems that darker-skinned men play “villains” whilst the lighter-skinned men play leading “hero” roles. It’s obvious that colonialism has contributed to anti-blackness in the South Asian community, leading to colourism. This was displayed in everyday life during my trip to Delhi, 6 years ago, where the majority of darker-skinned Indians seemed to take on roles where appearance was ignored, such as a cleaning job, while many lighter-skinned Indians were in high professional roles, almost mirroring the Brown Paper Bag Test. On my travels down to Chennai, where most of the population is darker-skinned, I hoped to find a foundation for myself. But, to my surprise, I discovered that the foundations were marketed at caucasian or lighter-skinned Indian women. A saleswoman approached me stating that she was previously as black as I am, but was saved by the infamous bleaching cream Fair & Lovely, which sells more than Coca-Cola in India. So, how do we begin to educate young South Asians to look at their dark skin in an empowering light when in reality, if you live in India, you could be denied a job, a marriage, or an acting role because of it? 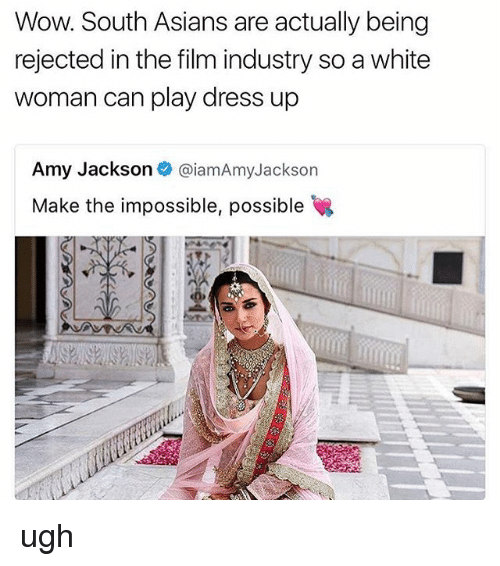 Sure, you could argue that Bollywood hiring a white actress is bringing diversity to the Indian film industry, but if so, why haven’t we seen a dark-skinned black girl being cast for a leading role in any Indian film? Would she be as successful as Amy Jackson, or would she be playing “the woman that would be taken to the hotel” due to her dark skin? Growing up in France as a dark-skinned Tamil girl, I felt I couldn’t identify with anybody on TV. My parents would purchase Ayngaran tapes featuring the hottest music videos from the Tamil film industry and, surprisingly, I couldn’t identify with the actresses in these videos either as they were light-skinned. Then, as if that wasn’t enough, we moved to the UK where I first met Indian, Pakistani and Bangladeshi girls, and I noticed that the similarities our cultures shared would not override the idea that I was darker and therefore lesser than them. I realised I would never fit into the UK South Asian community. I began to loath South Asian culture as I received moronic comments. “I can’t see your features because you’re so dark”, “she’s too blick to be pretty”, “don’t be out in the sun”. Watching MTV Base and seeing dark-skinned black women on TV would make the 11-year-old me feel good, because women who looked like me were being glorified. When Serena Williams would win a match, it felt like I had won the match. This felt like an achievement at the time, but it later presented a problem in that I felt confused about me, who I was and where I came from. I didn’t want to adopt a culture that wasn’t mine and culturally appropriate. At the age of 24, I visited my motherland, Sri Lanka, as the civil war finally ended. As I arrived in the northern region; I wept as I felt a sense of belonging, and no longer felt ostracised for my dark skin. Some questioned why I was not as light as my mum, but I learnt that we who are woke need to educate our families that Type 6 melanin is a part of our Dravidian history. If Bollywood, Kollywood and Hollywood still don’t love us, then I’m done waiting for them. We need to begin to love this skin by understanding what it represents, empowering each other and being proud of our melanin.